MOTORISTS ARE BEING warned to take care on the roads this morning following a cold and frosty night. A status yellow snow-ice warning is in place for Ireland until midnight tonight. Met Éireann is warning that there are frost and icy patches in many areas of the country this morning. Sunshine and wintry showers are expected throughout the day, with the greatest risk of snow early this morning. Connacht and Ulster are most at risk of snowfall, especially on high ground. Rain and sleet will fall later today, heaviest in the west and northwest. Some isolated showers are expected in the southeast. It will be a cold day again, with the temperature dropping as low as 4 degrees, with gusty west to northwest winds. Frost conditions will persist again tonight with icy patches expected to develop in many areas. 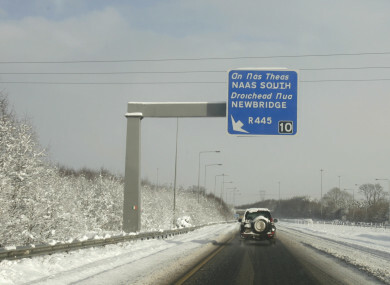 Met Éireann has warned that temperatures could be as low at -2 degrees. AA Roadwatch is reminding drivers that stopping distances are 10 times longer on snow and ice. It said that gentle manoeuvres are the key to safe driving. “Use major routes as they are more likely to have been gritted than secondary routes,” it said. With sunny spells also forecast for certain parts of the country, drivers are reminded of the danger posed by sun glare. Minimise risk by wearing sunglasses, ensuring your windscreen is clear of grease or grime inside and out and adding windshield washer fluid to the water in the reservoir. Meanwhile, pedestrians and cyclists have been advised not to underestimate the danger of ice. Email “Motorists warned to take care after a cold and frosty night ”. Feedback on “Motorists warned to take care after a cold and frosty night ”.